Our team of professionals is complete - dentists, dental hygienist, dental assistants and dental lab assistant - they will all take care of you. radiant smile with beautiful healthy teeth is a dream of perhaps any of us. Teeth are our reputation in two ways – they show how well we care of ourselves; teeth in a good shape reveal overall health condition and our lifestyle. It is never late to start with professional care! The goal of aesthetic dentistry is to choose a treatment, which leads to natural and healthy looking teeth. We are reaching this goal with a help of the most modern techniques and materials. experienced dental hygienist will advise you how to care of your teeth and gums. Dental hygienist is an indispensable part of quality dental practice. Most of dental treatments are much more feasible and durable after the intervention of dental hygienist. Some of the treatments are even not feasible without dental hygiene. preventive dental examination should be followed by every patient. In particular, it is very important to start with them on time, at an early age of a child. Oral hygiene should start already around the age of six months, when first teeth start to erupt. It is necessary to take care of the first, temporary teeth as soon as they start to grow. Adult person is entitled by law to two preventive examinations each year. It includes examination of the condition of teeth, periodontal, state of mucous membrane and soft tissues; and of course X-ray examination. It should also include control of dental hygiene, scaling of plaque and pigmentation (airflow) and instructions on proper dental care. Pregnant women should come to preventive examinations at least two times during their pregnancy. 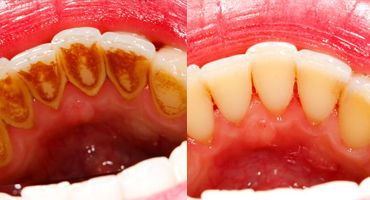 the basis of this treatment is, besides the prevention, also reparation of damages caused by widespread disease – tooth decay. Tooth decay damages your teeth and can cause inflammation of the pulp that is inside of each tooth. Treatment consists of restorations (fillings) to treatment of root canals (so called endodontics). 3D Endodontics – a condition for successfully performed endodontic treatment is a proper cleaning of canals. 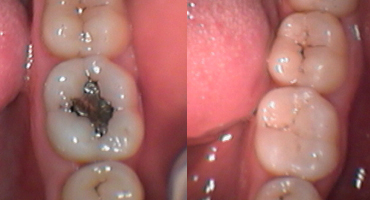 Cleaning is followed by hermetic closure of the canals to prevent further penetration of bacteria into periodontal. We fill the canals with the help of the most modern method, so called 3D filling, which means thorough sealing of root canals in all directions. Dental crowns and bridges represent artificial replacements of crown part of tooth and are attached to the sharpened (abraded) rest of the tooth. They are made out of a wide range of modern materials, including computer processed all-ceramic zirconium oxide materials. Removable dentures replace larger number of lost teeth or a complete loss of teeth. We divide them to partial and total. 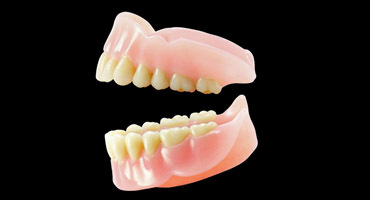 Partial dentures replace larger number of lost teeth. They are fixed to the remaining teeth with help of different retention devices, e.g. metal clips or plug connections. Total dentures replace all lost teeth and also missing soft tissue (gums). Its functionality depends not only on a proper fabrication, but also on the conditions inside the mouth of each patient (alveolar shape, quality and quantity of saliva, mucosal thickness etc.). Children are very specific group of patients for Dentim s.r.o. They require individual approach and also collaboration of parents. Active parental involvement is particularly important in dental hygiene, because children need a help with teeth cleaning. Even parents should learn about proper dental care, already before the child is born. Poor oral hygiene and the number of bacteria that might dwell in the mouth can negatively affect the development of baby´s healthy teeth. First visit of the dentist is suitable when the deciduous (milk) teeth start to grow, e.g. at about 6 months of the age. Early visits should not only result into examination of the teeth, but also get the child used to the dental practice. Our team will help you with the right brushing technique and other important aspects of prevention. Teeth jewels are aesthetic decorations that are bonded to the tooth surface with the help of a special adhesive. There is no harm to enamel or to surrounding soft tissue. The bonding process is done by halogen curing light and is painless. Dental hygienist judges the chosen tooth after the consultation with patient or makes an alternative selection. Proper dental hygiene is recommended by dental hygienist in case the patient is interested in application of tooth jewel. Durability of dental jewel after proper application depends on used material, size, load on the given tooth and following of dental hygiene. Jewel should stay in place at least 2 months up to several years, however, it is very individual. 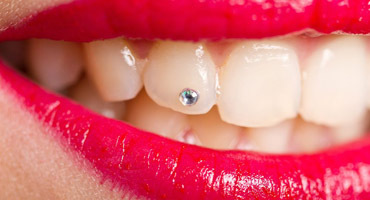 Jewel can be removed anytime, painlessly and with no harm to the tooth.